Spring Is In The Air: Don’t Forget Your HVAC & Plumbing! The summertime can be a very busy time for many families. From going on family vacations, heading out to the beach, or going on those summer getaways with loved ones, it is easy to overlook those pesky plumbing, or HVAC problems that can pop up at any time back home. With just a few, simple steps, most problems can be avoided with regular maintenance, to ensure you have a great summer while at home, or away! So let us help you make these unwanted worries disappear. Everyone has heard of or has had some type of plumbing/ HVAC horror stories, from busted pipes, to broken heaters, and sometimes the cost that comes with fixing these problems. The fact is, many problems can be avoided, like maintenance on your car, your home needs this too. Having your HVAC system serviced regularly, can help diagnose problems that can cause mid-summer breakdowns. Simply changing the filter on your HVAC system, removing brush, and shrubs from around the outside unit, making sure drain lines are not clogged and blocked can help prolong the life of your system, and even make it run more efficiently, saving you money on utility bills. Water problems can prove very costly, from running toilets to leaking faucets, these little problems can become big problems, and can add up to 90 gallons of water loss per day. That’s like letting money run right down the drain! By checking around toilet bases for sitting water, or tightening loose connections on your faucets, these problems can be easily fixed, in little to no time while saving you money. Have your HVAC system serviced before the change in temperatures. Change filters in your HVAC unit regularly, this helps the unit run more efficiently, saving on utility bills. Make sure doors and windows are sealed to keep cool air from leaving the home in the summer. Have a programmable thermostat installed to raise temps while away and lower temps when you are home. Check for leaks on toilets, running toilets and dripping outside hose bibs as these can cause water bills to be higher than normal. Make sure sump pumps and water pumps are not constantly running. Flush water heaters to remove sediment buildup. Install a back-up sump pump for when the power goes out. Let our well-trained HVAC team help you get geared up this season with a more energy efficient a/c and/or heater. Fletchers is an authorized representative for the Energize Delaware program that could save you thousands on a new HVAC system. Pair that with great manufacturers rebates and you can really upgrade to a top-of-the-line HVAC system for little to no cost. We know that choosing a company to let in your home can be stressful, at Fletchers we hope to make that choice an easy one. 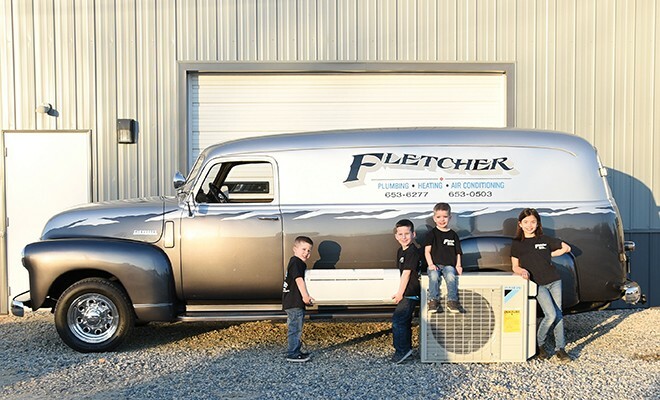 As always, Fletchers Plumbing, Heating, and Air Conditioning is here to help with any problems you may have around your home this season. With great spring, and fall specials, FREE estimates, easy finance options, fast and efficient 24/7 service, or for any questions or concerns you have, we are always just a phone call away. There are many ways you can reach us, whether through our website www.fletcherplumbingheatcool.com, over the phone 302-653-0503, 302-323-0503, and directly on our Facebook page. Fletchers is BIG enough to handle your problems, but small enough to care! Let our family help your family. ← Previous Story Destination . . . Willey Farms! Next Story → Window Treatments: Don’t Stress, Impress!